In the “Request for Disposition of Remains” form included with the letter, the army itself suggested his remains be returned to the United States and reinterred at Long Island National Cemetery, a suggestion to which my grandfather assented. Though not the closest military cemetery—Cypress Hills National Cemetery may be a smidge closer—it would certainly have been acceptable. At this point, it’s fairly easy to assemble a timeline of what followed the army’s letter requesting a decision from my grandparents about the disposition of Babe’s remains. That timeline follows a few other brief observations. In a fairly lengthy telegram dated Jan. 26, 1949, my grandparents learned that Babe’s remains were en route to the United States and that it might yet take another five days to four weeks before a funeral could take place. In fact, it took a little longer. I do not know whether my grandparents attended. I have no reason to think they didn’t. A later document called “Information for Next of Kin of World War II Deceased” refers to the telegram and goes into greater detail about what would happen upon the arrival of Babe’s remains on U.S. soil. 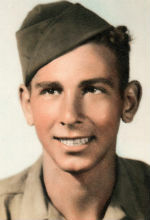 As it turns out, Babe’s remains were buried for the last time on March 8, 1949—nearly four years after he was killed. An article from Archives.com explained the process and, in part, why it took so long. Nov. 20, 1947. This is the date stamped on what I presume is the returned “Request for Disposition of Remains” form the army sent my grandfather a couple of weeks earlier. This is the form assenting to Babe’s relocation to Long Island National Cemetery. It’s a little confusing because I also see several other dates either written or stamped on the form, including Nov. 19, 1948 (which honestly looks like a mistake, to me); and June 3, 1948 (seven months later). June 15, 1948. This is the date of the “Disinterment Directive” form, which must be the order to dig up Babe’s remains. Aug. 4, 1948. The date Babe’s remains were placed in his final casket (from the same form). Jan. 26, 1949. Date of the telegram from the Quartermaster’s Corps I mentioned earlier. March 8, 1949. The date of the “Receipt of Remains” at Long Island National Cemetery. The form indicates Babe’s remains were escorted by Sgt. John D. Tiger. Another form indicates this was the date Babe was buried. Note: The photo above is of Long Island National Cemetery, taken by Wikipedia user Jim Henderson and given to the public domain.